The Red Sox have been tinkering with Tanner Houck’s arm slot and pitch grips throughout the year in effort to find the best combination of pitch types for him. Earlier in the year that involved raising his arm slot and incorporating more four seamers into his mix, but now Houck’s fastball and arm slot look more like they did in college. His results have been better of late as he’s walked six and allowed nine runs combined over his last six starts. His low slot makes it easier for lefties to see the ball out of his hand and Houck will still need to find a way to counteract this issues to profile as a starter. While his overall line is still disappointing, Mickey Moniak is slashing .298/.341/.465 since May 22. 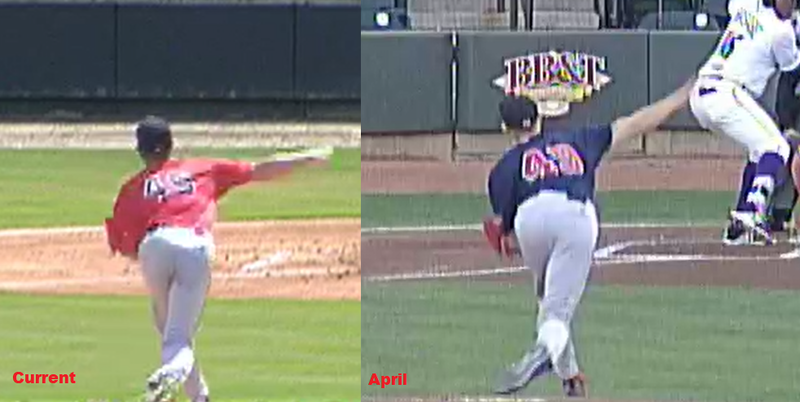 He’s made a subtle swing change that has him taking a using bigger leg kick with his knee driving back toward his rear hip (similar to the one Adam Haseley adopted while in Clearwater this year) and he’s also striding closed which has helped Moniak deal with stuff on the outer half, which had been a problem for him as a pro. I’ve asked teams for updated reports on Moniak and the pro side of the industry think he has tweener outfielder tools but acknowledges it appears he’s been playing a level ahead of his ability so far. The industry considers him a big leaguer but thinks it’s going to take some time. Bryan Abreu has generated varying reports throughout the year, at times 92-94 with a 50 breaking ball and 40 control (which is barely a prospect) and others when he’s been up to 97, sitting 94-95 with big vertical action on one of two his breaking balls. He’s accrued double-digit strikeouts in two of his last three starts and has a 69:13 strikeout-to-walk ratio in 42.4 innings this season. The Astros are great at installing coherent pitching approaches into their prospects, most of whom are high-spin fastball/breaking ball guys who work up in the zone with their heaters, an approach which leads to more strikeouts. This, combined with Houston’s piggyback approach (where hitters don’t often see the same pitcher three or more times), leads to lots of strikeouts. I think the fastball (which is pretty straight) plays better out of the bullpen and I’m skeptical of Abreu’s short-term walk rate improvement because I’ve still got scouts questioning his command and it’s been an issue for Abreu in the past. I have him projected in relief and have added him to Houston’s team page on The Board. Kiley wrote today about how he thinks the Rays have identified pitching subtypes that have skills to fit somewhere on the value spectrum between the perhaps unnecessary extremes of typical six or seven-inning starters and single-inning relievers. I’d like to talk about a few other oddball skillsets that might have a place on a 25-man roster as they help perform traditional and necessary on-field tasks but come in atypical packages. I’ve given them names that that the Cespedes Family BBQ kids will improve upon. This role, in which a player acts as relief specialist who can also play the outfield, has actually been utilized in the recent past and has been explored by other clubs in the minors even more recently. Outfielders with superlative arm strength or pitchers with plus athleticism could put an extra late-inning hitter or two at platoon disadvantage. The Astros have done this with Tony Sipp, bringing him in to face a lefty before sending him to the outfield while someone else gets righties out, and then returning Sipp to the mound to face another lefty. It seemed Houston might have hoped Rule 5 selection Anthony Gose would have been able to do something similar, but he didn’t make the team out of spring training and was returned to Texas. Texas also has several candidates for this type of role in Gose (who is also a 70 runner and good defensive center fielder), James Jones (plus runner, plus outfield defense, low-90s with loopy breaking ball on the mound) and Jairo Beras (right-handed, mid-90s fastball, plus-plus raw power) who have all converted to the mound but have one or two other useful skills that could enable them to be deployed in the right situation. James Jones, LHP, Texas Rangers from Eric Longenhagen on Vimeo. Former big league OF Jordan Schafer would seem to have fit this archetype as well and he was used in various ways by different clubs (Atlanta played him in the outfield, the Dodgers tried to make him a base-stealing specialist for the 2016 stretch run and St. Louis tried him on the mound) but never in several different roles at once. Rick Ankiel, who is attempting a big league comeback, is perfect for this kind of role, too. He could shuttle back and forth from the outfield to the mound a few times, while also pinch hitting when it makes sense to have a power-before-hit bat at the plate and pinch-running on occasion. If someone like this already exists in the Rays system it’s RHP/OF Tanner Dodson, who the Rays wanted announced as a two-way player when he was drafted out of Cal in June. Dodson sits in the mid-90s on the mound and is also a plus runner who hit near the top of Cal’s lineup last year. He’s not polished in center and has a slap/slash approach at the plate, but there’s premium arm strength and speed here. We hoped you liked reading Daily Prospect Notes: 8/15/18 by Eric Longenhagen!